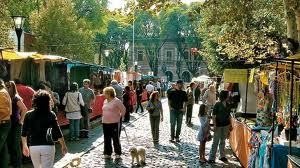 The neighbourhood´s main attraction is the Mataderos Fair (de los Corrales Ave. and Lisandro de la Torre Ave.), which stands at the border of Buenos Aires City. Here, the atmosphere submerges the visitor in a space evocative of a farm homestead or rural village. Not far stands the Mercado Nacional de Hacienda, founded in 1890 and appointed National and Historical Monument. This old building endows the area with a quaint atmosphere, pleasant to the eye and all other senses, drawn by the folklore performed by music bands, the fragrant and tasty local fare, such as "humita" (maize) and "locro" (stew), and the chance of purchasing native handcrafts. A large number of stands display leather goods, silverware, "mates" (gourds), "ponchos" and sweets. Scarce meters away stands Bar Oviedo (L. de la Torre Ave. 2497), over a century old, which boasts of having the best meat "empanadas" (turnover pies) in town. Don´t miss the Museo de los Corrales (L. de la Torre Ave. and De los Corrales Ave.), which features typical gaucho objects, such as carts, a well, silverware, a cob oven and a scale model of an old "pulpería" (tavern). 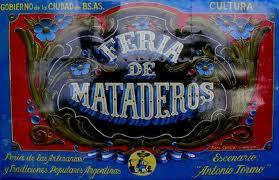 - Mataderos Fair: Dance, fair and native cuisine. Every Sunday and holiday, starting at 11. - Museo de los Corrales: Gaucho traditional lifestyle, represented by over 3000 pieces. - Bar Oviedo: It still draws "payadores" (improvising folksingers) who gather at its tables and strum their guitars for visitors. - Carrera de sortijas: This typical Creole horseback competition takes place during afternoons at the Mataderos Fair. 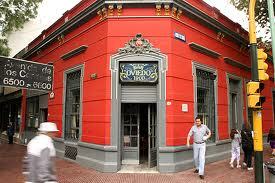 - El Cedrón: A typical neighbourhood pizzeria, which serves one of the best pizzas in the area. 6101 Juan B. Alberdi st.